Last week I tuned in to the Nashville t.v. series premiere. Almost the first words to come out of someone’s mouth (a dad to his daughter): “Honey, it’s bad manners to talk about money.” I recently explored the money taboo as it relates to fundraising. Today’s post digs a bit deeper. Subsequent posts will dig into two other ways we go wrong when we ask our boards to raise funds. In the end we’ll have a recipe for success. 1. We let them think it’s about money. 2. We let them wallow in how painful the process is. 3. We’re unclear with them about their very special role. The problem with letting folks think fundraising is about money. When we ask board members to go out and seek MONEY we lead them down a very uncomfortable path. It’s better not to go there and to stay well within the comfort zone. And, it turns out this is relatively easy as long as we remember one thing: Folks do not invest in charities because organizations need MONEY. Fundraising is about inviting people to participate in making a difference. We’re comfortable giving not because organizations have needs, but because organizations meet needs. A gift to your organization is really a gift through your organization to the community. People make philanthropic investments because they want to HELP. So your job is to help your board members connect with and envision the hungry kids… neglected environment… abandoned animals… all those wrongs that need to be righted. They must feel that when they ask for a gift they are asking to CHANGE these things. They are not asking for themselves. When our organization is successfully MAKING A DIFFERENCE and helping to transform lives, then it is incumbent on us to secure financing to continue that mission. It’s a privilege, and board members should be honored to be a part of a noble, effective cause. They should use pride, not apology, when asking for an organization that is successfully meeting a need. Negative phrases that stem from our discomfort with money must be retired. No more: “I’m going to hit him up”… “I’ll go twist her arm”… “Every little bit helps”…“You probably hate to get this call, but…” If this is how we approach people, no wonder folks find it distasteful! Who wants to have body parts attacked? Who wants to do something ‘little’? I prefer more uplifting and expansive phrases like “investment” and “giving” and “impact”. People follow their investments. People love gifts. People want to create impact. Fundraising is not a monetary transaction. No. It’s a transforming, values-based process that matches a donor-investor who cares about the values your organization enacts with the values you are enacting. You’re doing what they already want to do. You help them transform their ideals into actions and carry out their dreams. If we’re primarily talking about money, we’re lost. Fundraising is about helping. It’s about enabling folks to be the change they want to see in the world. It’s about making a difference. 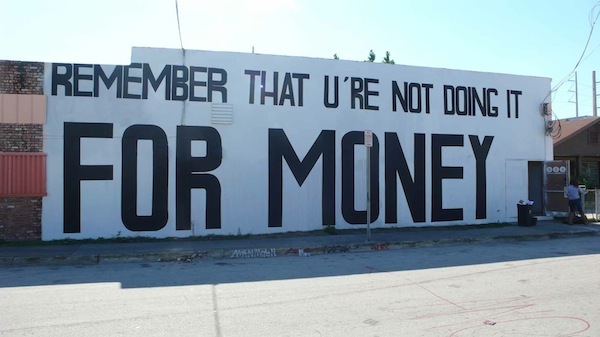 It’s not about money. Even the best fundraising tips, training and support in the world won’t work if negative beliefs (for example, “money is the root of all evil” and “nice people don’t talk about money”) are in the way. How do you overcome these deep-seated beliefs?